I’m doing a Fab Finds post and roundup post in one week because there are lots of winners to share this season. These particular items were client favourites recently, and we’ve actually had some Spring weather to do them justice. Be sure to browse all the colour options and read the rave reviews. 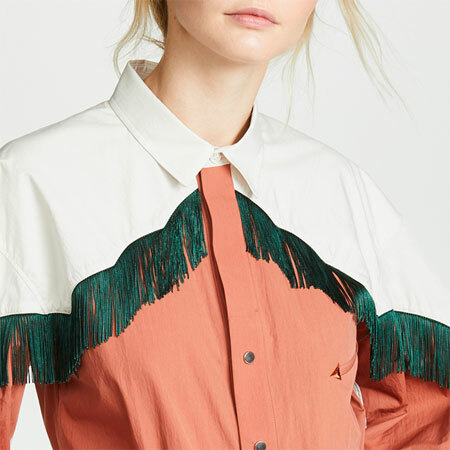 Vineet Bahl | Anthropologie Giovanna Silk Blouse: A romantic blouse with beautiful blouson sleeves that are cuffed so that they don't drive you batty. A warm earthy colour. Great semi-tucked. Best suited to a smaller bust. Wilt | Anthropologie WHIT Gingham Wrapped Blouse: A structured wrap top with architectural ruching. Tailored and forgiving on the midsection. Great over high-rise pants and skirts. Olive gingham is unusual. Best suited to those who can fill out the bust and/or shoulder line. Eri + Ali | Anthropologie Audrina Lace Top: Pretty lace top that works on a range of body types. Fluid yet streamlined. Not see-through. Shorter bell sleeves are the way to go so that they don't annoy you. One September | Anthropologie Sydney Floral Top: A knitted boho-lite blouse with excellent drape. Casually pretty. Club Monaco Weylyn Shirt: Best hectic architectural shirt I've seen to date. Gorgeous shade of blue. Beats most of the designer styles to my eye, and much more affordable. 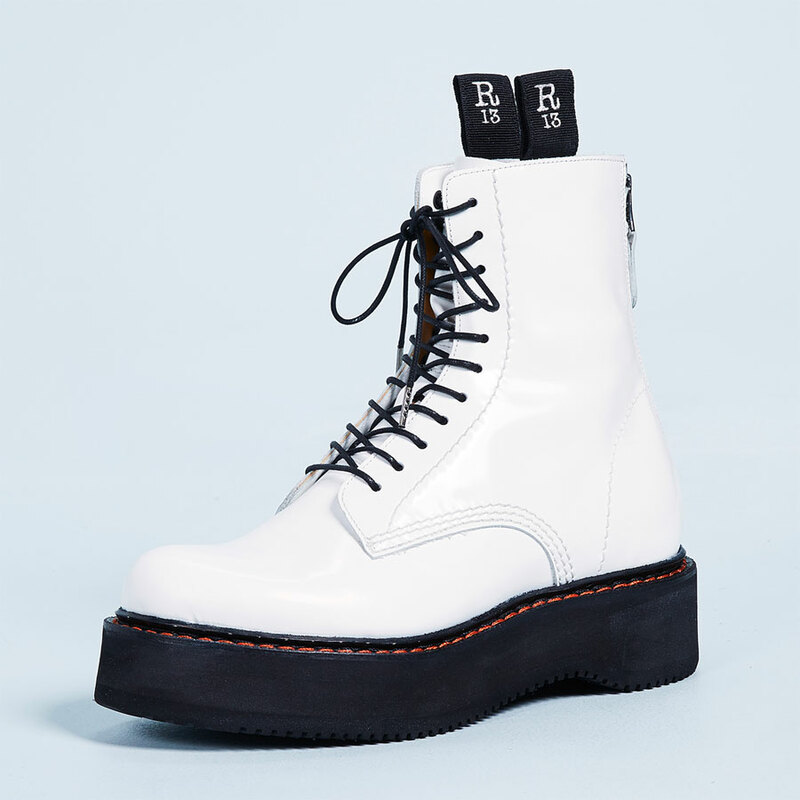 Oversized, yet tapered in all the right places which adds just enough structure. It's not overwhelming, even on my slight frame. It earned a place in my wardrobe despite the wide neck because the cut is BRILLIANT. The collar that drapes down the back is cleverly positioned, and my chunky pearls fill in the gap on my neck. I like it best semi-tucked for structure. I wear it with Summer skirts and white jeans. I LOVE this shirt. My wild card for the season. Party at the back, and good with short hair to showcase the back detailing. Madewell Central Ruffle Sleeve Shirt: The ruffle sleeve shirt has more structure around the neck and shoulders than a wrap top and looked much better on my body type despite the oversized fit. The flutter sleeves also broaden my frame, and I like the effect. The fabric is GORGEOUS and drapes very well, and it followed me home. Size down a size. Michael Stars | Anthropologie Michael Stars Shine V-Neck Long-SleeveTee: Fab V-neck tee that works on a curvier figure. Does not cling. Substantial fabric. Flattering and versatile. Streamlined. The XS/S will fit US0 to 4. The M/L will fit US6 to 10. City Chic Classic Trench Coat: Gorgeous trench coat for Team Tall with a regular or long waist. Best on a curvy body type with a defined midsection. STUNNING length. Elegant. LEVI'S MADE & CRAFTED Embellished Boyfriend Trucker Jacket: A statement denim jacket if ever there was one. The embellishment is quite the work of art. 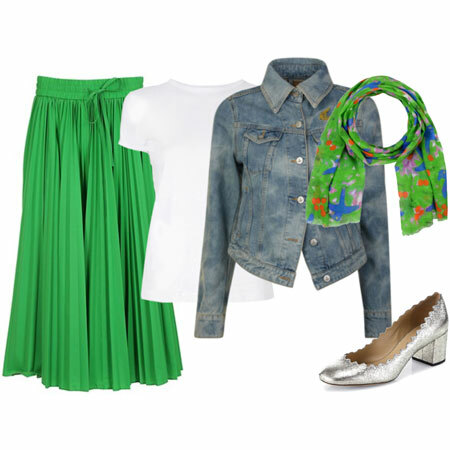 It straddles the line of Tomboy and Girly and creates a fab juxtaposition. It's NOT a tailored fit. Looks like a designer piece. Loft Elbow Patch Knit Blazer: I couldn't believe my eyes. A Summer equestrian tweed blazer that is 100% COTTON, fully lined, and machine washable. Gorgeously soft and comfy. Tailored, and works on a range of body types. The pearl grey is lovelier in person. Size down. Loft Swingy Raincoat: Super cute Modern Retro raincoat. It's supposed to be trapeze-shaped and roomy. Size down. Anthropologie | Anthropologie Easy Moto Jacket: Best knitted moto jacket of the season. Extremely comfy, tailored, relaxed and distressed, yet quite polished. It suits a range of body types because the fabric and cut mould to the body. Also available in a warm earthy apricot. Banana Republic Collarless Peplum Denim Jacket: If you don't like stiff Tomboy denim jackets - TRY THIS ONE. It's extremely soft, comfortable, and has a lot of stretch. Very tailored and quite sharp in silhouette. FLATTERING. The fit is fabulously streamlined despite the subtle peplum. It's longer in person than on the model, so don't worry about that too much. Every client who has tried it on so far has liked it. It works on a range of body types because it's tailored and moulds to the body. It can absolutely pass for business casual because you have to look very closely to notice that it's denim. Plus, you can dress it up. Fab with pants, jeans, skirts and dresses. It's uniqueness and my love for denim jackets gave it a spot in my wardrobe. 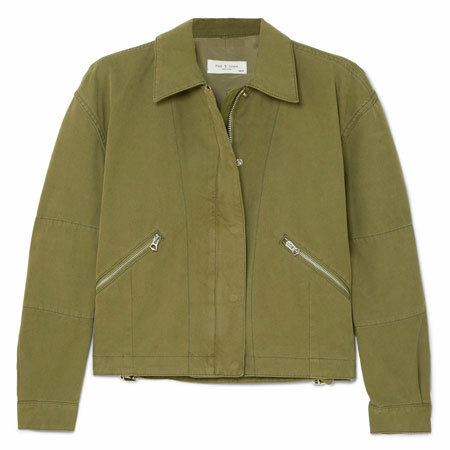 Loft Peplum Utility Jacket: This utility jacket looks better in person and is available in olive. It's soft, pretty, trendy, and excellent layered over bell sleeves. Size down a size. The sleeves look even better folded over once to create a cuff. FRAME Stripe Blazer: Gorgeous blazer made of luxurious fabric that is non-crease and drapes like a dream. Soft, pretty, sharp and professional. Size down, and best on a straighter body type. A quality item. It took my breath away when I saw it modelled by a forum member in person. Halogen Tweed Open Front Jacket: It's unusual to see a Spring tweed jacket with a revere collar that creates a flattering V-neck, AND is in jewel tones. Best on those who can fill it out. Suited to a larger bust, apple-shaped body type, and short waist. Rebecca Taylor Ava Peplum Jacket: Stunning business formal jacket that layers over pencil skirts and sheath dresses with the best of them. The peplum is subtle and architectural. A quality item. Black, not navy. Boden Long Sleeve Wrap Top: A form-fitting faux wrap made of substantial fabric. Does not cling despite the close fit. Excellent layered under jackets and blazers. Comes in colours and patterns. Nice quality. Boden Sylvia Jacket: A playful Modern Retro jacket that's extremely well made. Stunning fabric and workmanship. A-line in silhouette and works on a range of body types. The yellow is more mustard than citron in person. Works really well over skirts and dresses too. Boden Claremont Blazer: An impeccable Modern Classic blazer that looks chic. The finish inside is beautiful, and the lining might make you smile. Works on a range of body types because of the superb cut and quality fabric. Loft Striped Stitchy Boatneck Sweater: Best classic striped Spring pullover I've seen all season. The inset side colour blocking is genius, creating a vertical streamlined effect that offsets the horizontal stripes. The neckline works on a range of body types. Nice fabric and good length. Size down. Loft Dotted Lantern Sleeve Shirred Blouse: Pretty lantern sleeve blouse that layers quite well under a blazer because the exuberant sleeves are soft and slippery allowing them to comfortably collapse and hold their shape when the layer is removed. Size down. Loft Brushed Dot Cutout Mixed Media Shell: A simple and effective shell top to wear under a cardigan or jacket. Comes in plus sizes. Size down. Marrakech | Anthropologie Magnolia Zip Jacket: I haven't seen this jacket in person yet, but it looks interesting, and has super cute back detailing. Nordstrom Signature Waffle Stitch Cashmere Sweater: A warm pullover in a Spring colour ticks off the boxes when Spring feels like Winter. A quality piece that comes in turquoise. Sleeves are long but can be cuffed. Works on a range of body types. Fluid yet streamlined fit. Banana Republic Double Breasted-Fit Seersucker Blazer: A pinstripe seersucker blazer that looks better in person. It can hang open so don't worry about buttoning the front. Crisp, fresh and on trend. Works really well on petites. My 5ft client wore it over a sheath dress and looked stunning. Review of LOFT peplum jacket (olive) — by Christina F.
Great finds, as always, Angie! My heart beat a little faster at the sight of the yellow silk blouse. I would be willing to try it on and check the color, if it weren’t silk. My next favorites are the Easy Moto Jacket and the Magnolia jacket. Both have the structure I like and the shapes are gorgeous. The Magnolia might be better with my hair….looking for lightness in my new purchases. Thanks for rounding up such beauties! Gorgeous. I have learned the hard way to keep my Spring and Fall capsules micro-sized because our seasons transition so fast. The opportunity to wear “in-between” items is rare. I learned that on YLF from Forum Members with similar climate issues. One more lesson. Great finds! The Anthropologie items are gorgeous. Too pricey for me but definitely inspiring! I’m with Sterling, my spring and fall seasons are short so if it can cross over so much the better. So many pretty choices! 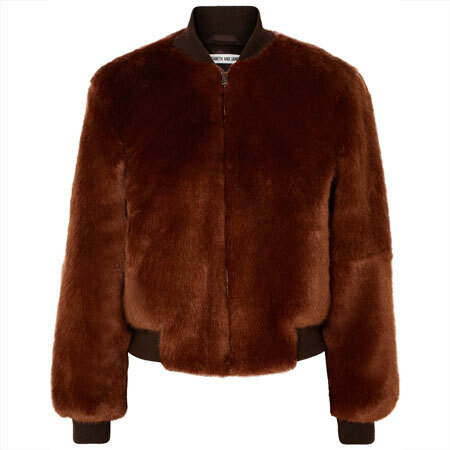 Wish I’d seen that Loft jacket while my size was available – would be a fun item for a warm fall & wnter climate! Angie: you had me at “best hectic architectural shirt”. Now I have to go read the rest. These are beautiful Finds. Wow, such a wealth of interesting items this year. I love your new architectural shirt! The blouses are beautiful also, though mostly not in my colour scheme. That’s okay — others will appear! Thank you for the fab round-up, Angie. I got the BR peplum jacket, so far it looks good. I got in in regular and in tall because of my longish torso but the tall was not flattering at all as the back pleats did not drape properly. I am looking for tops and will read your post with more time this evening. The collections page link isn’t working! Lovely collection as usual with something for everyone,I particularly like the wrap blouse,blazer and stripy jumper. THAT MOTO SHOULD BE MINE. Thanks for the additional finds this week! I decided to order both the Anthropologie Magnolia Zip Moto and the Loft Peplum Jacket in Olive. As well as a few additional Anthropologie and Loft items (dresses and tops) that caught my eye. I really need summer weight toppers for the office a/c. I normally don’t wear black, but the photo looked like it was a soft black which can work, but I fell in love with the magnolia print edged in olive. My size was not available in petites so I ordered a regular (regular jackets often work for me if I can turn up the sleeves). Fingers-crossed. I can attest to the great styling of the Anthro moto jacket. I tried it on and thought it was fabulous. The olive green skewed too grey for my personal wardrobe needs and the peach is not what I would want. Boo hoo! So many beautiful choices, though luckily a lot of them are in the wrong-for-me colors. I have ordered the striped Loft sweater and thinking of both Loft dotted blouses. My BR denim jacket order was cancelled, but will try to reorder. I am also interested in the striped BR blazer as I have the matching ruffle skirt. Finally, I really like the Loft grey blazer, and need to stalk it in case my size comes back in stock. I really like the Boden cropped swing jacket. The stitching detail and curved lapels are irresistible. So tempted by that olive moto! Lots of lovely temptations here. I have a weakness for fun jackets and you have found several. I see your denim BR jacket is back in more sizes. So many great pieces. What would you recommend for me? Andi B, the link is working now. 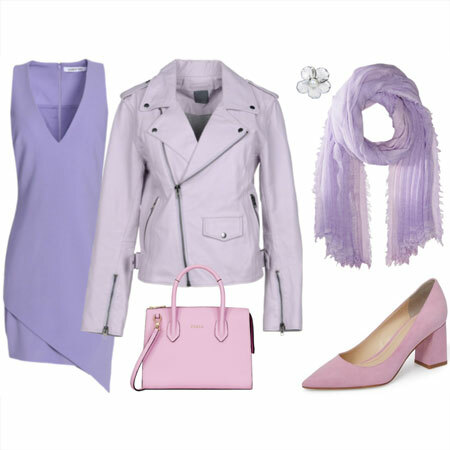 What a fantastic spring season it’s been in terms of style. In the Midwest, it seems the weather is finally catching up! Can’t wait to wear many of the fab items I’ve picked up in the past couple of months. And tempted by a few more here, but I’m hanging on now until NAS (if you can believe, it’s about 11 weeks away!). Thanks for the excitement, ladies. There are items here you can wear in Summer, and especially in a/c. Minus the bulky knitwear of course. So I don’t get that part, actually – Robin, Ryce and Sterling. HAH, Eliza. You crack me up. Suz, try the CM shirt. Joyce B, I thought the BR jacket would be better in a regular size. Rachy, I like gingham too. Scarlet and Diana, try the moto. Toban, my fingers are crossed. You ABSOLUTELY need to layer in a/c. Kim M, thanks for the validation. Tanya, hope you get your goodies in your size. Smittie, it’s such a gorgeous jacket. I wish it came in turquoise. Joy, I vote the Boden Sylvia jacket and the Loft Grey blazer. Laura, YAY for Spring weather. Here too. It was very slow to warm up. And high five, my Spring and Summer shopping is DONE until I hit the bag selections in Italy at the end of June. The olive moto and the floral jacket from Anthro would fit in perfectly with my cool weather wardrobe. I have found some really useful things at Anthro. Lots of pretty things here. I especially like the Club Monaco striped blouse. The Loft trapeze rain jacket is cute, but I can’t see the value in a raincoat that short. I need length, so the water doesn’t just run down the jacket and drip all over my legs (even with an umbrella)! At least that’s the problem lately, with the windy rain we’ve been having. Your enthusiasm and passion in these write ups makes me want to go out and add every single item to my wardrobe! Thank you always for your research and sharing! Oh my gosh! That camel trench coat was made for me!! Team Tall and Curvy here. I’ve always wanted a trench coat…might have to try swinging this one! Love the MS stripe tee, and the Anthro moto jacket — but neither of the available colors suit me well, so I’ll enjoy that one vicariously. I may have to try that stripe tee if I place a Nordstrom order anytime soon. Janet, do you mean striped blazer? Firecracker, lets hope that awful wind and rain is behind us for a while. April, you crack me up. bonnie, Anthro has been looking SO good this year. Great selection Angie. Anthro has been looking good this year. I am hoping to make a trip there next week. I am very intrigued by the two v-neck tops you chose for yourself. Lots of great jackets too! V-necks are definitely on the rise. I really like that Magnolia jacket from Anthro. And it’s cotton too. Tempted. Angie, I was referring to the Michael Starrs striped long sleeve tee. But I just got a striped long sleeve Zadig & Voltaire tee in Munich a couple of months ago, so maybe I don’t need more striped tees! I loved the LOFT elbow patch blazer, Angie, too bad it is already out of stock. You are so right when advising us to shop early in the season. So many beauties. I like everything shown here. It’s a really great season.